COMPACT LASER BORE SIGHT – These units are made to be caliber specific. Select either .308 or .30-06 from the drop menu. PRECISION ACCURACY – Laser will display a 2″ dot at 100 yards. SAVE TIME AND AMMUNITION! Save time, cash, and frustration by getting on paper with just a few shots for fine tuning. Our skilled laser bore sighter is machined to the easiest standards to verify the easiest accuracy. Insert 4 batteries (+ aspect up) throughout the rear opening.  Laser Hazard Class llla. The laser hazard class has been decided by an independent laboratory and complies with the 21 CFR 1040.10 and 1040.11.  Four(4) AG3 button cell batteries supplied; this unit will work with three (3) batteries.  Sighting vary 15 to 100 yards – Beneficial distance is 25 yards indoors. DO NOT ATTEMPT TO SHOOT THE LASER BORESIGHTER. 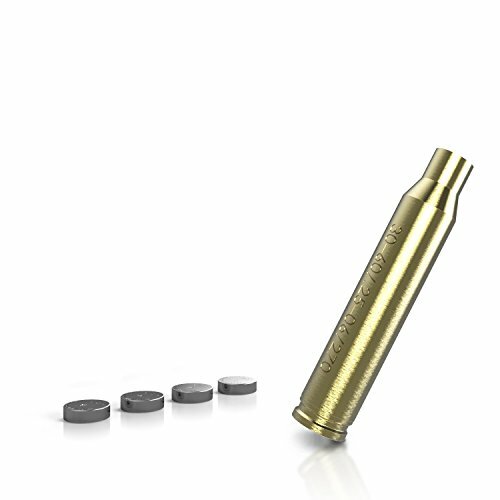 COMPACT LASER BORE SIGHT – These units are made to be caliber explicit. Make a choice either .308 or .30-06 from the drop menu. FAST GUN ZEROING, SIGHTING – Designed for speedy gun zeroing and sighting – Sighting vary 15 to 100 yards – Beneficial distance is 25 yards indoors.